The popularity of mobile devices has grown exponentially over the past 10 years. Today, they connect us to the world around us no matter how far that may be and make our lives extremely convenient. 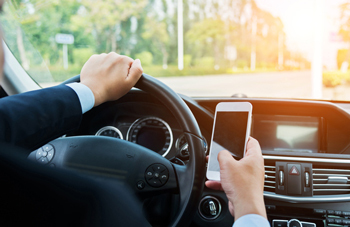 Many people are so connected to their phones that they struggle to disconnect while driving. Texting and driving or texting while driving, accounts for at least 1.6 million crashes each year. During daylight hours, approximately 481,000 drivers are using a cellular device while driving. In honor of National Distracted Driving Awareness month, below are tips on how to drive safely and avoid the temptation of texting and driving. Turn your phone off when getting into the car. We all know the sound our phone makes when we receive a text message or phone call. If you feel the urge to even look at who texted you or called, eliminate this distraction completely by turning your phone off. Some other options include switching your phone to airplane mode or muting the volume. Put your phone somewhere you cannot see it. Even if your phone’s volume is muted, seeing your screen light up can be a trigger. Placing your phone in your purse, a center console, back seat or glove compartment takes away this temptation. Send automated messages when people attempt to contact you in the car. No matter how important a call is, it can wait. Receiving 10 text messages from the same person can be distracting. Many mobile devices now allow you to send automated messages informing the sender that you are driving and will contact him/her when you reach your destination. If you have an urgent call or text that requires you to respond immediately, safely pull over your vehicle. Sometimes you can’t wait to answer a text message or take a call. Emergencies happen, but how you handle them is important to you and those around you. These safe driving tips are important for you to apply to your own driving practices, and they also educate others on safe driving. Studies have found that 16- to 24-year-old drivers are most likely to use their mobile devices while driving. Parents and friends can have a big impact on the future safety of our roads. Laws and technology are constantly evolving to make our driving habits safer, but it starts with education and awareness. This month, be the change you want to see on the road.